I feel it right to be upfront and say we are about to go on a journey. The matter at hand is something that has become very close to me and it directly affects anyone that lives and works in a house or building. 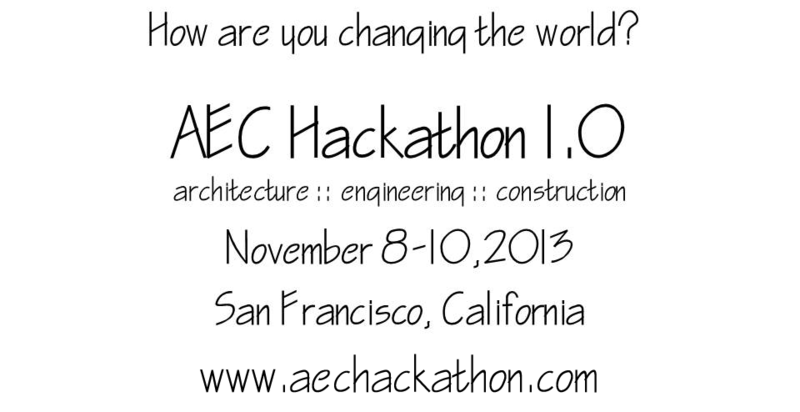 In a few weeks there is going to be a first of its kind event called the AEC Hackathon. This event will break new ground in how we think about design, construction and communication about our built environment. But before we talk about this, lets step back and see how I got here. It all begins seven years back to when I was working in downtown San Francisco with one of the legends in my field. On a day like any other, I see our boss come into the office chatting with another guy that introduces himself as a home builder. This builder goes on to share how he is using game-like technology and robotic manufacturing to improve the home building process. Wait, did he say video games and robots to build houses? Before SF, I spent 15 years in Dallas, Texas. Here is where I got bombarded with construction sites due to the ongoing suburban sprawl, constant road construction, and land redevelopment. I am among the ranks of many that have become familiar with how construction is done solely through observation. It didn’t take long to see the theme in what I know can’t be only the Lone Star State. Sure what I am about to say could be construed by some as an extreme generalization. I saw job sites of low wage day labor, crews of various races though the majority I swear only speak Spanish, shovels that help prop people up, the occasional ‘2/3 watching while 1/3 working’ rule, and a number of other ‘?’s that are a part of how things get built. So here’s this builder in our office saying things can get built this way. Only in SF I am thinking, but yeah how can I help. That decision started me into the new world of where web3D meets digital fabrication for building in the Architecture, Engineering, Construction Industry. Over the years I’ve worked on the development of various applications that provide services to our team, partners, and future home owners. I have been around the world and seen the latest in AEC technology from R&D labs, practitioners in the field, startups, and colleagues at work. I have also been educated to and exposed to inefficiencies and problems that confront the industry in residential and commercial. The industry is super wasteful (materials and data), projects usually are over time and budget, it’s hyper litigious, and the list goes on. I will never forget the moment I learned that the norm is to low bid a project and make up costs and margin in the inevitable change orders due to the ambiguity of the design. 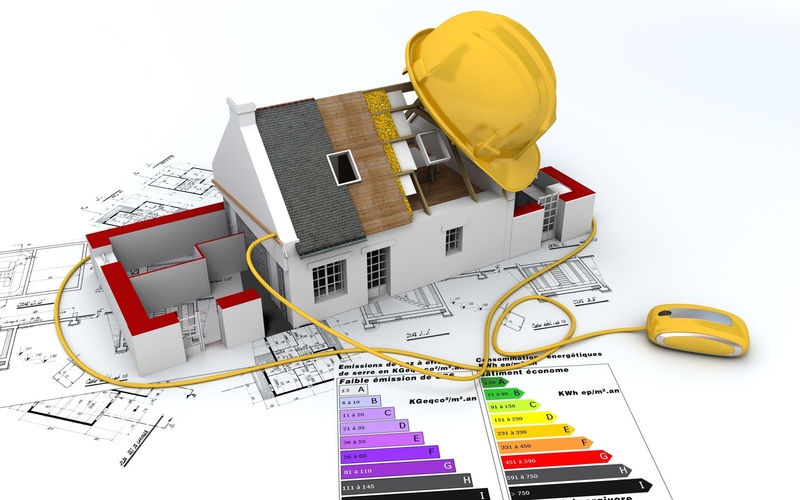 Yes there are plenty of honest professionals out there and projects that come in on time and even under budget, but take your own poll with home and building owners. Needless to say, there is plenty of room for improvement. Luckily, this multi-trillion dollar industry is approaching an interesting point in its evolution heavily influenced by technology, economics, the need to be more sustainable, and a cultural shift as it welcomes in the next wave of AEC professionals. Technology is changing the way structures are designed, fabricated, built, marketed, and run. A quick visit to AEC-Apps will provide numerous examples of how software is being integrated throughout a building’s life cycle while groups like the Digital Fabrication Alliance are using tech to improve manufacturing and building processes. Buildings and even cities are becoming ‘smart’ as more networked systems connect with them and the Internet of Things. There are even events like McGraw Hill Construction ENR’s Future Tech conference that focus on the intersection of technology and AEC. Yet technology integration has its own challenges. For both small and large firms it is a serious investment of time and resources. Steep software learning curves, problems with data exchange, solutions that don’t perform to expectation, and a growing number of new problems make going back to the old ways not a hard thing to consider. At least there one knows what to expect to go wrong and how to fix it quickly. It also doesn’t help that the industry is constantly approached by technologist and startups selling services and products with no knowledge of industry problems or sensitivity to industry data standards. Plus where are the futuristic building apps that I see in movies or those that use innovative tech like augmented reality or interactive 3D? It is these reasons and more that prompted me to act upon the idea of a hackathon for the AEC Industry. I can’t think of a better environment where AEC professionals and technologists can come together to build community and create solutions for the industry by those in the industry. And not just as a one time event or to build another iPhone app, but take it up a notch. Let’s provide hackers with access to the Oculus Rift, Google Glass, LEAP Motion, Kinect, and other innovative hardware. Offer them workshops to learn the latest in API’s, SDK’s (e.g. Intel), web, and interactive 3D standards. We’re raising the bar to ‘AEC goes Iron Man/Tony Stark’ type applications and all tailored to solve real problems. Thus began my quest to round up a posse and it didn’t take long to get great people on board. Initially stepping up to the challenge were Greg Howes (builder & fabricator), Christopher Peri (architect turned techie), Justin Quimby (game developer rockstar now in AEC), Paul Doherty (architect & smart cities guru) and Michael Shaw (The Digit Group). We have grown into a bigger team of all stars and what an event it is going to be. For attending tech devs and UX/UI designers, it will be an opportunity to connect and create solutions for those building our real world. For AEC professionals it is a chance to have their voice heard and paint the bullseye for what tech solutions are needed. For those that don’t want to participate in the hack but want to learn something new, we have workshops for them also. 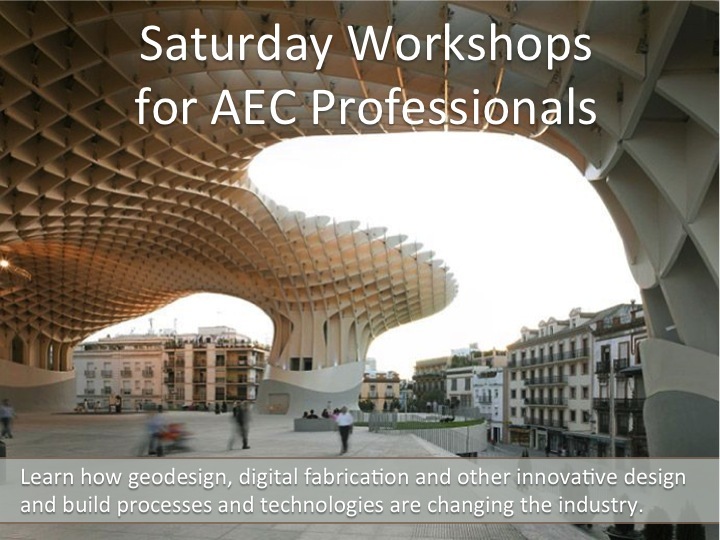 Workshops for AEC will cover geo-design, digital fabrication, big data, ‘smart‘ buildings, and other design-build processes and technologies that are changing the industry. We also have the team at VRcade that has proposed coming down from Seattle to demonstrate some relevant applications in immersive virtual reality for all to experience first hand! But what would an AEC hackathon be without actually building something? So with that said, there is planned a digital fabrication project that will be happening during the hackathon. 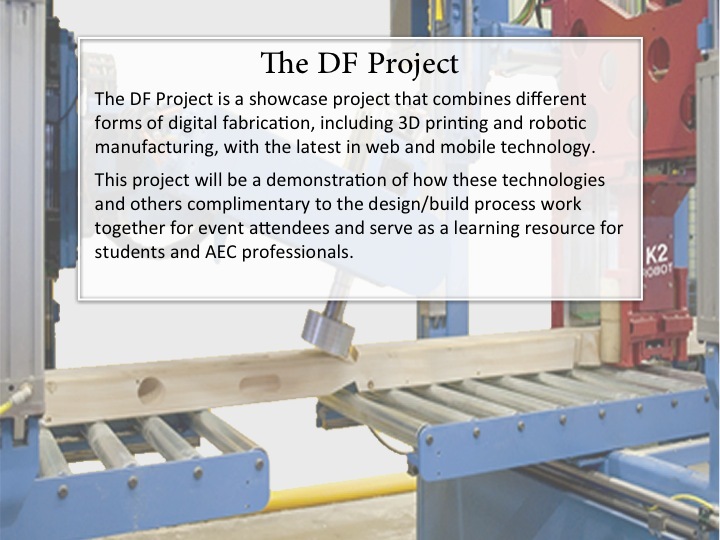 The DF Project, as it is currently named, is a showcase project that combines different forms of digital fabrication (including 3D printing and robotic manufacturing) with the latest in web and mobile technology. This project will be located at Laney College in Oakland and serve as an educational resource that showcases a digitally fabricated structure in addition to digitally fabricated objects housed inside the structure. This project will be a demonstration of how these technologies and others complimentary to the design/build process work together for event attendees and serve as a learning resource for students and AEC professionals both at the college and online. The digital assets of this structure and objects will be available data sets to tech designers and developers at the event to hack with. Additional proceeds from the event will go to the Wounded Warriors Project and Vets in Tech as we believe in supporting our veterans however we can. Extra proceeds from the Digital Fabrication Project will go to Laney College to support their new digital fabrication course coming next year. What good is having an event like this if you can’t help others along the way? While it is still a work in progress, the AEC Hackathon is shaping up nicely. We have some great sponsors already (Khronos & Web3D Consortium) and more coming on board that will be announced soon. I truly am honored to be working with such a great team and sponsors to be a part of an industry first that is long overdue. If you would like to support what we are doing, there are ways to get involved. We still need assistance getting the word out to the tech and AEC communities, and additional sponsors means we can have a better event, provide the community with the digital fabrication learning resource project, and have more to contribute to very worthwhile causes we are supporting. So if you’re a tech developer, UX/UI designer, game programmer, building owner, land developer, city/government official, AEC professional in the office or in the field, and interested in improving the built environment come join us. We need your passion and talent on this journey for creating better tools for those building us a better world. Where will you be Nov 8-10 when the world watches AEC get hacked?